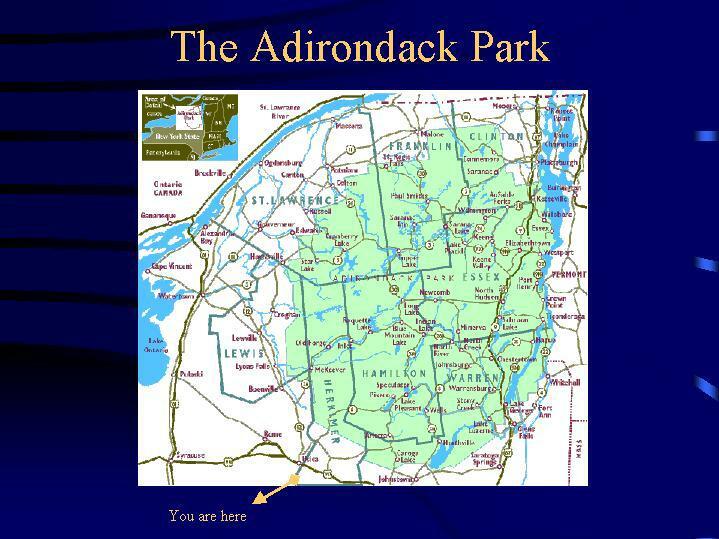 The Adirondack Park, located in upstate New York, suffered the worst damage in the nation from acid rain. Utility plant pollution from the highly industrial Midwest states of Ohio, Illinois, Indiana and Pennsylvania, is carried Northeast via wind patterns. As the winds rise over the Adirondack Mountains, the moisture they contain cools and condenses into clouds. The moisture, saturated with heavy amounts of nitric and sulfuric acid, precipitates onto the Adirondack Mountains, damaging the vegetation. Precipitation can be more than 200 times more acidic than natural rain, with a pH of 3.3 or less. Now, more than 500 lakes and ponds (out of 2,800) in the Adirondack Park are already too acidic to support the plants and aquatic wildlife that once existed in them.